What makes these fixtures great for any user? 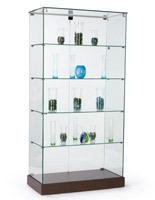 These trophy towers, rectangular display cabinets showcase glass in elegant yet industrial-grade construction. 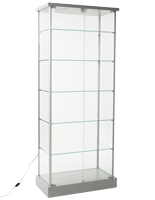 Whether you use retail display cases in stores, museums, schools, or at home, these trophy towers attract viewers. 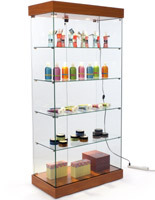 These showcases, also known as rectangular display cabinets, are accessible in 36 inch and 48 inch width models. 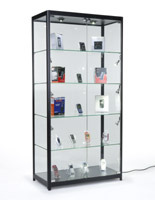 The showcase and its shelving are made of tempered glass. These rectangular display cabinets measure between 29" and 40" wide, great for placement in the middle of a room or against a wall. This ensures the units have a compact yet spacious interior. Each model incorporates glass in a durable frame with a choice from black or silver polished metal trim. These full-view curio cabinets stand either wall-free or against a wall. A plunger lock on the glass door ensures security for these display cases. These units include three to four 20 watt halogen lights on top and ten 20 watt side track lights. 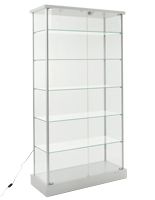 Trophy sizes can be accommodated by adjusting the curio cabinets' shelves. 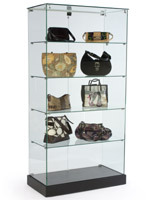 These retail display cases incorporate floor levelers, to maintain durability on any surface. 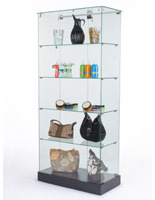 For a high-quality glass showcase, shop online from this collection of curio cabinets. What are the special features of these retail display cases? Frameless construction enhances the floating effect of the glass setting. Twenty-watt lights generate higher illumination than in other trophy cases. 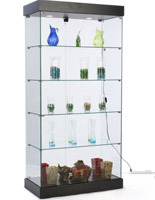 Floor levelers are included in these curio cabinets, to accommodate uneven surfaces. A canopy and base in black or silver metal anchor a minimalist design. This type of showcase is an ideal choice for any store because they can exhibit merchandise with high visibility. 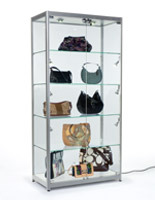 This makes the cases also great for galleries because they can illuminate works of art and other curios. In addition, they can be used in schools to show off trophies and student projects. 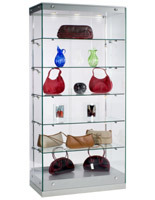 Order today for quick shipping and wholesale pricing on DisplayCabinets2go.com!